Whoever is putting together these Detroit Symphony programs for 2015-2016 has some very odd ideas of what goes together. Since admitting that the season opener had no theme whatsoever, Leonard Slatkin and his orchestra seem intent on creating strange bedfellows for each subsequent concert. The two serenades that opened the program were a lovely pairing, and mostly very well done. It's a shame that the second half of the program was nowhere near as convincing, for two distinctly different reasons. The Dvořák Serenade had never been played at Orchestra Hall, which is only mildly surprising. It calls for extremely small forces, and only works on a modern subscription program if you're going to pair it with another such work, as done here. The three horns the work calls for were fallible, but they don't do all that much and didn't really distract from an otherwise enjoyable performance. As he's aged, Slatkin often appears happiest with a small group of musicians, where he can't get bogged down with large forms, Pacing was excellent here, and the winds of the Detroit Symphony are almost always delightful. Credit the players for cultivating such a richly Czech flavor, especially in the outer movements, that recalled the composers' masterpieces. Slatkin's recordings of Elgar and Vaughan Williams for RCA remain some of his greatest achievements on disc, and perhaps no one Stateside does this music better. The orchestra's strings are exceptional, and as led by Concertmistress Yoonshin Song, have rarely sounded better. Slatkin created a magical atmosphere that was only enhanced by the storied acoustics of Orchestra Hall. Moderate – and never indulgent – tempos were allied with outstanding ensemble balance. While hardly a major work (it's not to be found on our site to this point), it is unquestionably beautiful. The Mozart that led off the second half had the same beautiful string tone, but without the genuine feeling and joy of the serenades. Never a great Mozart group, the Detroit players came dangerously close to over-sweetening their string tone, while attacks lacked focus. While the woodwinds sounded equally pretty, the whole affair lacked character and completely missed the drama and strength of the best late Mozart. In short, this was an "old-world" performance that failed to carry its years well. While comparing a live concert to recordings is a habit I've largely abandoned, even a dinosaur like Bruno Walter revealed more clarity and dramatic impetus than Slatkin did here. Frankly, none of his Mozart performances have thrilled me, but this one was arguably the least of singularly undistinguished bunch. Mohammed Fairouz is an interesting composer who I praised in these pages for actually writing music as opposed to just creating projects devoted to Middle-East peace (which, I noted then, are full of great intentions and occasionally effective). His Concerto for Clarinet was focused on conflict in Egypt, and here Fairouz seeks to use the cello in this world premiere performance to depict the four angels that feature in the three monotheistic religions that dominate the Arab world. It was a daunting and rather abstract set of ideas – even for music, mind you – and as interesting as the work was, the ideas here were not fully realized. 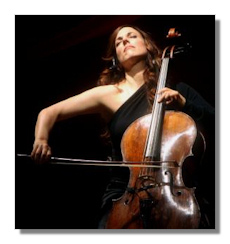 Maya Beiser is a young and talented cellist for whom this work was written, but her "rock star" style of playing and tone did not mesh well with the overall message, an opinion shared by the cellist that I brought with me. Relentlessly repetitive tunes dominated the outer movements, with the finale striking me as especially cheesy. Don't get me wrong, there were many passionate and even moving moments here, and nothing is less than sincere, but it's not a work I need to hear again soon. Perhaps more distressingly, the orchestra and conductor seemed not to enjoy the piece at all, and though they played very well, the impression was that only the soloist was truly engaged. Stunning cadenzas aside, my concert buddy for the evening (who is a music teacher and has several enviable musical gifts) found little to enjoy, and I'm sorry to have to agree. Fairouz is a unique voice, but this particular work lacks the range and expression of his others. All told, this was an interesting and oddly-matched evening that had the potential to be more.